Back in 1999, manufactured “boy bands” were dominating the charts, the Yankees were in the midst of yet another dynasty, more than half the country was tuning into “Must See TV” every Thursday Night, and of course Call Center Week was born! Call Center Week was a harebrained idea created to provide 80+ call center managers with an annual event to discuss best practices in agent training, emerging call center technology, performance metrics, quality assurance, cost reduction and other critical customer service priorities. Fast forward almost 20 years. While at first glance it may seem as if we are still looking at similar priorities, so much has changed in our industry….and as a result so have we! CCW now serves more than 3,000 attendees annually! With the emergence of multi channel and then followed by the omni channel boom, it was clear that this was no longer your father’s call center. As service operations adopted new, more representative terms to describe their function from contact center to engagement center, it was clear that the customer service operation was going through a transition. ...and this transition would serve as the centerpiece for customer loyalty, retention, and brand differentiation for years to come. And it would only continue with the convergence of the customer experience function and contact center operation to form a holistic, end-to-end customer interaction. 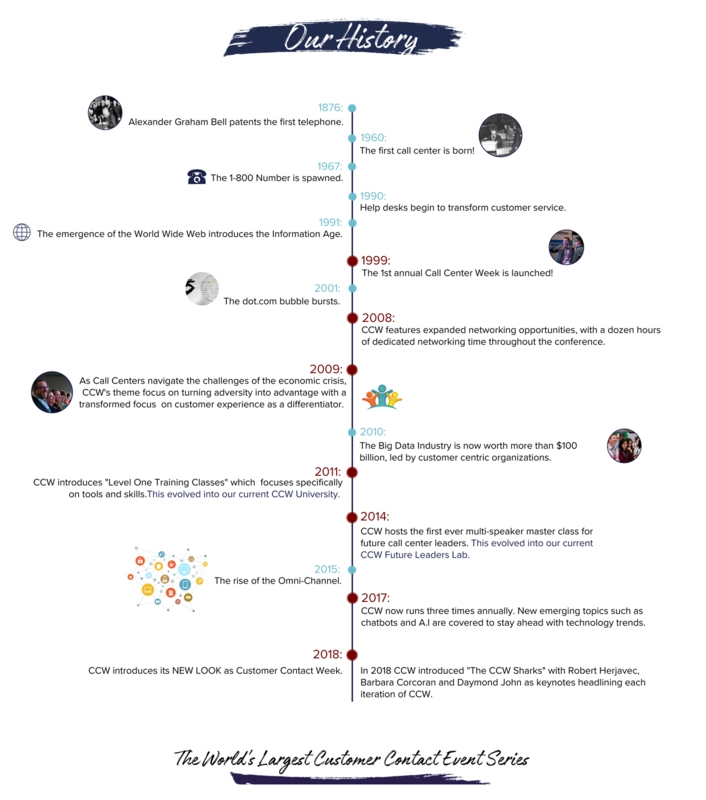 Call Center Week was born in 1999 and now Customer Contact Week is born again in 2018! CCW is brought to you by the Customer Management Practice - the Analyst, Advisor, and Industry Network for all things Customer Management. Customer Contact Week (CCW) will continue to be the place where customer care, CX, and contact center leaders come together….only now with a new look, more inspiring speakers, more educational content, more community-oriented networking, and the same unforgettable experiences!